When water or treatment is essential to your production, the Roanoke, Virginia region offers an all-round resource solution for your needs. It starts with an abundant supply of very high quality water. Followed by available treatment capacity without surcharges. All at costs well below the Virginia average. Combine that with low costs of living and doing business and your company can seek a new level of success in the Roanoke, Virginia region. Capacity — Current demand is only 43 percent of available daily supply of treated water. Redundancy – An interconnected distribution system provides reliable supply. Softness – Largest sources range from soft to only moderately hard and don’t require softening for a wide range of industrial uses. High Quality – Sourced at the headwaters of the Roanoke River so there is no upstream development to affect water quality and reports show substances within ideal goals. Consistency – Large reservoirs limit impacts of storm water. Savings – Based on volume, water rates are 17 to 22 percent below the Virginia average. Capacity – Daily average wastewater flows average just over half of capacity. No excess strength charges – an advanced tertiary treatment system and unused capacity allow you to save on critical operating costs with no excess strength charges on wastewater. Partnership – Easy pretreatment permitting and no-cost pretreatment permits. Liberal limits – food industry effluents are allowed in greater concentrations eliminating or limiting the need for pretreatment. Savings – Based on volume, sewer rates are 26 to 40 percent below the Virginia average. The Roanoke Region offers some of the lowest electric rates in the United States through Appalachian Power (a unit of American Electric Power). The chart shows a comparison of monthly industrial electric rates, based on 75kW and 30,000 kWh/month. Dominion Virginia Power also serves part of the region with affordable rates. The 2015 reliability rate for the Roanoke market is 99.969% (excluding major storms). Gas is supplied by Roanoke Gas and Columbia Gas at very competitive rates. Propane is also available. Local telecommunications providers include Verizon, Lumos Networks, Cox Communications, Comcast, Shentel, Centurylink, MidAtlantic Broadband Corporation, and Citizen’s Cooperative. The region is served by a robust fiber network linking major commercial and institutional centers with regional and national providers. Major long distance carriers include AT&T, ZAYO, Level 3, Allied Fiber, among others. Phone and data services are available through all of these providers. Wireless data and voice services are available throughout the region. The region has extensive 4G LTE mobile data service coverage. Providers include Verizon Wireless, T-Mobile, AT&T, Sprint, and nTelos. The Roanoke Valley Broadband Authority operates a 50-mile regional network with fiber-based, business-class service. The bandwidth offered through the Authority’s services is exclusive to the end user and is ideal for institutions and businesses that must move large volumes of data reliably. The authority allows customers to lease dark fiber. Dark fiber is unlit fiber strands which allow clients that wish to install their own electronics to light their own dedicated fiber strands leased from the authority. Approximately 25 percent of the regional network is devoted to dark fiber. The entire Roanoke Region is currently in attainment for all criteria pollutants monitored by the EPA. This important status represents substantial savings in both money and time as you work to establish your business in the Roanoke Region. The US Environmental Protection Agency (EPA) classifies the air quality of each county in the United States as either meeting federal standards (i.e. “attainment”) or not (i.e. “non-attainment”). Significant industrial facilities locating in a non-attainment area often face a longer permitting process. In many cases, facility managers must invest in additional pollution control technologies thus increasing the capital costs required to establish operations. Air quality has steadily improved in the Roanoke Region. 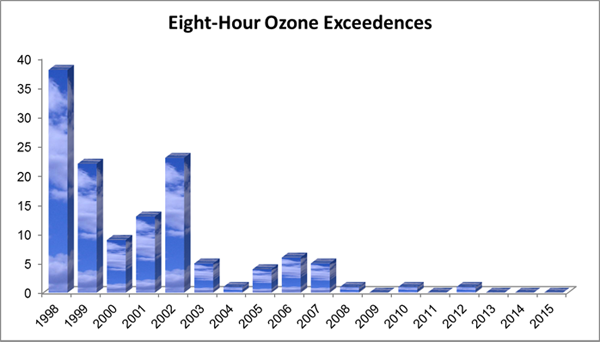 The chart below shows the number of times the region has exceeded the ozone standard in an eight-hour period each year since 1998.